Partly cloudy in the morning then becoming cloudy with periods of rain later in the day. High 72F. WNW winds at less than 5 mph, increasing to 15 to 25 mph. Chance of rain 70%..
A few clouds. Slight chance of a rain shower. Low 46F. Winds NNW at 10 to 20 mph. Holiday hours: Closed all major holidays. Special hours: We are usually open each day from 8 am – 5 pm. However, it is often necessary for us to temporarily close when making deliveries. By telephoning us at 309-596-2684, we will set up a time that will work best for you and we will be certain to be here. Welcome to Hilltop Mini Buildings and Lawn Décor. We are located at 1156 US Highway 67, Viola, IL 61486 which is 15 miles south of Milan, IL or 2 miles north of Viola, IL. We are very easy to find as we are located at the top of a hilltop right along Highway 67. We began our business in 1999 and are dealers for Amish and Mennonite built wooden or metal storage sheds, open-sided sheds, cabins with covered porches, portable garages, gazebos, chicken houses, lawn furniture and décor, playhouses, and all-steel weathervanes. You can find a full listing of our products on our website at www.hilltoplawndecor.com and you can also see many of our products on Facebook at Hilltop Mini Buildings. 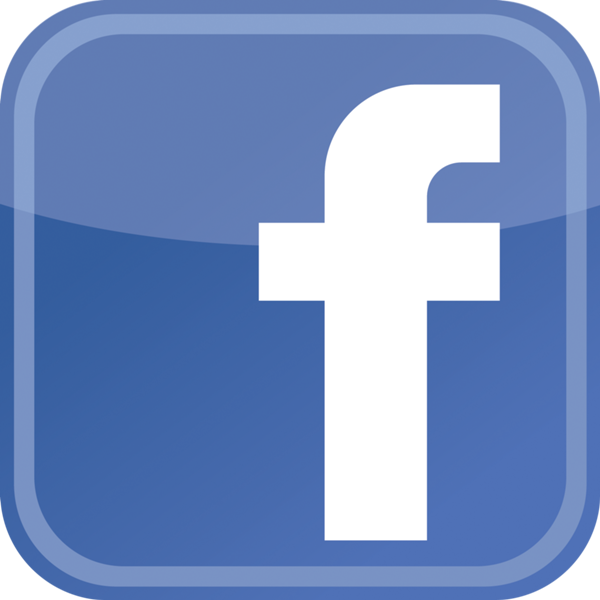 On our web site there is a link where you can request a catalog if you desire. Jeremy Nelson is in charge of our storage sheds, gazebos, and chicken houses and John Pollock is in charge of our lawn furniture, décor, and weathervanes. We strive to build or carry a quality product that can give you many years of use and enjoyment. Hilltop Mini Buildings is your dealer for Amish or Mennonite built sheds. The Amish and Mennonite are well-known for their quality material, construction, and craftsmanship. We feature a wide variety of styles, sizes, and exterior coverings. 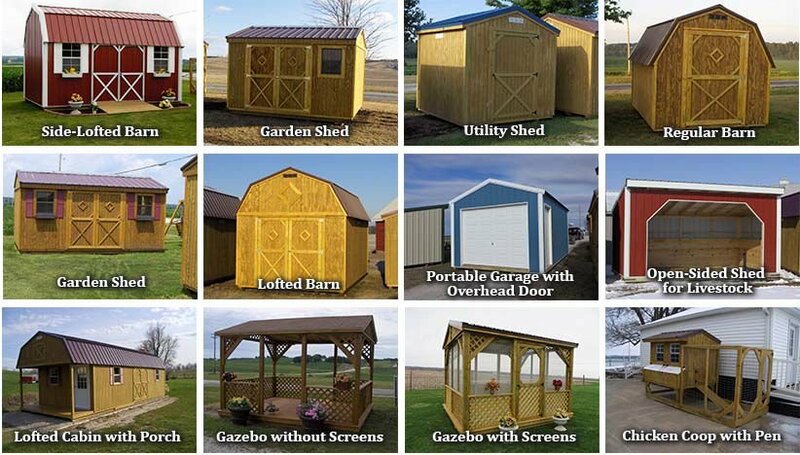 Our shed sizes range from 8x8 up to 12x32 and are available in treated wood, heavy-gauge metal, painted, or vinyl siding. Our sales staff is on hand to give you personal service in planning your shed to meet your needs. All exterior wood is pressure treated to protect against insect damage & decay and treated T-111 siding is used and a protective UV coating is applied. Exposed nails are treated to ensure no rust spots or stains. The 2x4 framed single or double doors are individually key locked. A series of screened air vents are positioned to create good circulation/temperature control. All buildings are built complete with their own treated floor on treated 4x6 runners. The wood-framed metal buildings come in many color choices. Various styles are offered in shed design and include Regular Barns, Utility Sheds, Garden Sheds, Lofted Barns, and Side-Lofted Barns. Many options are available to help you in designing the shed to meet your needs. Metal roofs are available in many color choices. 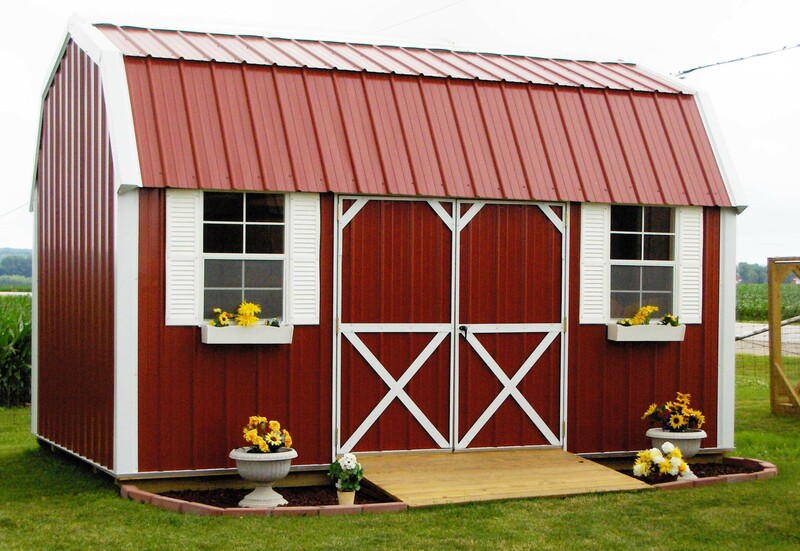 Other style sheds are also available and include Open-Sided Sheds for livestock, Chicken Houses and pens, Portable Garages with overhead doors, Cabins with covered 4 foot porches, and Gazebos – both screened or unscreened. All buildings are built complete and ready to use when we deliver them to you. We strive to give you great service and stand behind every quality building that we sell. A Rent-To-Own plan is also available as an alternative to mini-storage and allows you to quit paying rent for something you will never own. You may have the storage shed in your own backyard or business and you will own the shed at the end of your monthly payment plan. Or, you may simply rent the shed – a great idea for anyone in a temporary residence. We began in 1999 when a wood-working hobby became a full-time business. We enjoy outdoor lawn decorations but strongly believe in the importance of quality-made beautiful products that will last through years of use. In addition to the products we build, we are also dealers for Amish-built lawn furniture. The Amish are well-known for their quality of craftsmanship. All of the furniture is made of #1 grade treated yellow pine, kiln-dried before & after the treatment process. The result is a beautiful, lightweight lumber, free from the high moisture content of regular treated wood. The lumber is milled to a smooth surface & the edges are rounded. Then it’s carefully sorted to nearly eliminate unsightly knots & irregular wood grains. Our items are fully assembled using the best quality hardware. Other lawn décor we build include arbors, picnic tables, potting benches, garden bridges, and wishing wells – all made from pressure treated wood, quality hardware, and routered edges on the lumber. We believe you’ll be impressed with the craftsmanship, strength, & the elegant finish on these weathervanes. These beautiful weathervanes are handcrafted of heavy 14-gauge solid steel with 3 protective coatings to preserve their beauty. They’re zinc plated, powder coated with an antique copper vein powder which is baked on, and clear coated. The textured finish gives the appearance of the old time hammered copper look. There are 4 mounting styles from which to choose – the traditional Roof Mount, a 60” long Garden Stake, a 15” Post Mount or Deck Mount. There is also a vast array of individual top designs from which to choose. The entire selection is listed on our website at www.hilltoplawndecor.com A complete weathervane package includes your choice of a top design, choice of a mounting style, a sealed ball bearing windcup, and a NSEW directional.